We’re here to help! Read our FAQs, watch how-to videos, or get in touch! arrow_right How do I disable ads? It’s super simple and great value! The best way to disable ads from showing is to make an in-app purchase in the game. To make a purchase, just open the store in your game and select the item you want to buy. Once the purchase is processed your game will be ad-free. arrow_right How do I disable notifications? Open Settings on your device and tap Apps. Find the game in the list and select it. Under App Settings, tap Notifications to turn them off. Want to switch them back on and hear from our games again? It’s the same process! arrow_right I lost my progress. What can I do? Oops! Well, if you were connected to your Google Play Games account in the game’s Settings before deleting the game, then your progress should be saved automatically. So go ahead, reinstall the game again and connect it to Google Play Games. If the pop-up window opens, click on it to restore your progress. Unfortunately, if you weren’t connected to Google Play Games, it’s not possible to transfer the game state. arrow_right How can I save my game progress? Make sure the Connect To Google Play option is ticked. (Please note: Because we want to protect our younger users, this connection won’t be available for them). Your progress will now be automatically saved and can be restored on multiple devices. Done! arrow_right My game isn’t working as I expected. Your progress will now be automatically saved and you can uninstall the game. When you reinstall the game, simply connect to Google Play again, and you’ll be given the option to load your old game. But if that doesn’t help, don’t worry – just contact us at support@outfit7.com and we’ll see what we can do. arrow_right How do I make an in-app purchase? Open the game and tap the gold coin counter at the top of the screen, and go shopping! Select the item(s) you want to buy and head through to your app store to make the payment. The item(s) will be added to your game account once you’ve made the purchase. arrow_right How do I manage or turn off the option to make in-app purchases? Good question! You can do it through the general settings section on your device (it’s a good idea if you’re going to let kids play our games). You can find instructions here. Whatever you choose, whether with or without in-app purchases, our games are great fun – and you’ll be able to progress through the games either way! arrow_right Who processes in-app purchases? We don’t actually process payments or have access to credit card information here at Outfit7 – that’s all handled by Google Play. (Just something to keep in mind when it comes to post-purchase payments like refunds, as they will be handled by Google and subject to Google’s terms). arrow_right How can I change the name of my Tom in My Talking Tom 2? Your Tom needs a new name? No problem! 1. Tap the level indicator in the upper left corner of the screen. 2. Tap the name of your Tom. 3. Type in his new name and hit OK. And please don’t use your own name! arrow_right How can I transfer my My Talking Tom 2 game progress from one device to another? 1. Make sure you’re running the latest version of the game on your old device. 2. 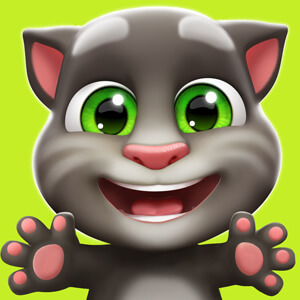 Open My Talking Tom 2 on your old device and tap the level indicator (in the upper left corner of the screen). 4. If the Connect To Google Play button says “Sign In”, tap it. If it says “Sign Out”, don’t tap it – you’re already signed in. (Please note: Because we want to protect our younger users, this connection won’t be available for them). 5. Download the latest version of the game on your new device and repeat what you just did using the same user account as your old device. 6. After playing for a little while on your new device, you’ll be asked whether you want to continue with the new game or load the old one. Choose the old one and carry on with the fun! arrow_right Can I transfer my game progress from an Android to an iOS device or vice versa? Sorry, but you can’t transfer your game progress between different platforms just yet. Check back in with us in the future – we’re working on it! arrow_right What are the game’s system requirements? The good news is that our games are compatible with Android OS 4.1 or later, and with devices with a CPU that supports the ARMv7 or x86 instruction set. arrow_right I can’t download the game. What should I do? Nothing should stand in the way of fun! Head over to Google Play Support to sort this out. arrow_right How can I download a game? The fun starts now! To download your new favorite game, just head to the app store on your device. Want to check out our other games (and their platforms)? Check this out.